Kinful is a social-emotional learning (SEL) curriculum to be used by teachers in the classroom. Cross-cultural connections, via VR, are just one of the tools within the curriculum used to achieve SEL outcomes. A typical Kinful lessons consists of non-sequential workstations where students rotate between activities. Half of the workstations are VR-related (viewing and 360 filming), and half are “standard” non-tech SEL activities (e.g. teamwork games, group reflections, etc.). The VR viewing and filming activities within that rotation are fundamental to Kinful’s vision and impact, but they make up only a portion of the greater Kinful whole. The tech and non-tech activities support and extend each other. 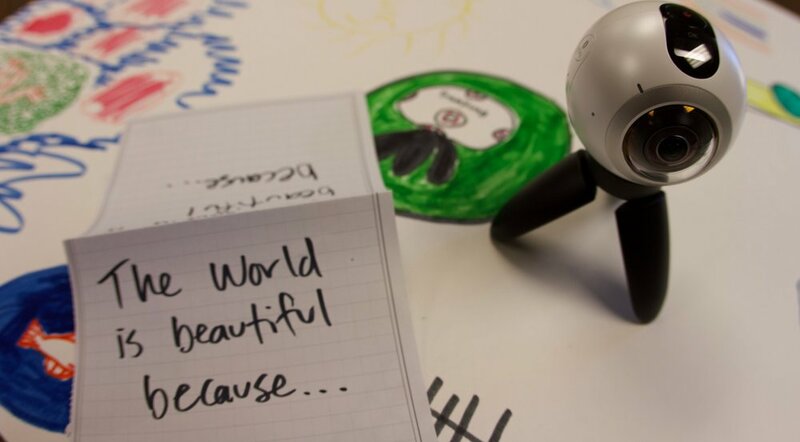 As students move from one workstation to the next, they experience and reflect on SEL themes individually, in groups, and through someone else’s eyes (VR). The binding element of all the activities included is not the technology, it’s the SEL themes. In fact, the non tech based activities outnumber the VR 5:1. Kinful is the culmination of our Peace Corps service, born from a defining philosophy: the simple belief that humanity will never realize its full potential so long as it remains divided. As Peace Corps Volunteers, we directly experienced humanity's natural capabilities to connect on a fundamental level. Humans, who just met and shared no common culture, instinctively laughed together, cried together, and treated one another like family. We quickly recognized these innate abilities — empathy, self-awareness, social awareness, etc. — as social-emotional learning competencies ready to be nurtured in all of us. Thus, the theory of Kinful — using social-emotional learning to combat social divisions — was born.